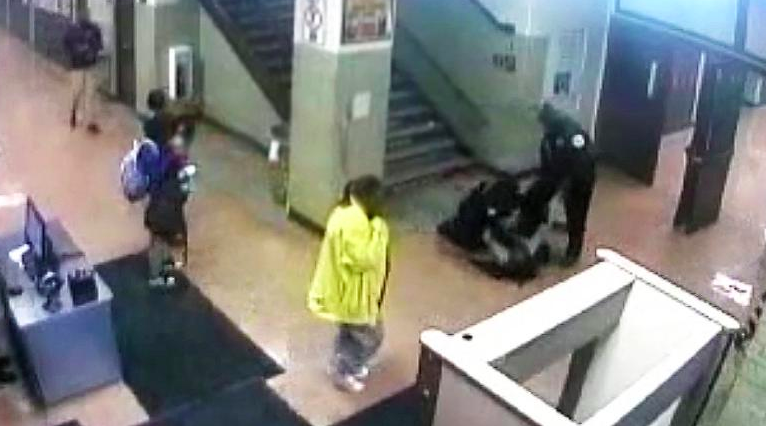 New Surveillance Footage Shows Chicago Police Dragging, Hitting And Tasing Unarmed 16-Year-Old Girl At School - T.V.S.T. 16-year-old Dnigma Howard was initially charged with two felony counts of aggravated battery. Police told everyone that she hit them first, which is why they had to escalate the situation. But newly released surveillance footage shows that’s not the case. The video clearly shows the officer was the aggressor. In the video, you can see Howard hugging her friend and then slowly turning around to walk away. As soon as she tries to walk away, the cop standing behind her grabs her violently and tries to push her to the ground, which results in her falling down the stairs. Once at the bottom of the stairs, another cop joins in. Two grown a** male cops punched, kicked and finally tased this 16-year-old girl. The charges that were originally filed against Howard have been dropped, but the family is rightfully not letting this go. They hired an attorney and have filed a federal civil rights lawsuit. You have an unarmed 16-year-old girl that was tackled and thrown down the stairs, punched, kicked then tased by the officers. It’s a saving grace for that young lady that the video tape existed. [Officers] made deliberately false statements about the incident. The attorney says Howard was physically and emotionally traumatized by this incident. She has changed schools, according to the report. The officers involved in this incident are no longer working at the school, which is a nice start, but they shouldn’t be working in a position of power anywhere. They clearly can’t handle the responsibility that comes along with it. “This case can be a catalyst for change within Chicago Public Schools and say ‘We don’t want this for our children. '” the lawsuit states. Wendy Williams Address Divorce On Her Show By Doing What She Does Best...Throwing Around That Shade!